Your favorite mouse, Maisy, goes sailing with her friend Charley - and Panda, of course! Their sails catch wind under the bridge, past the lighthouse and through the lagoon, easing back into the dock by dusk. With the great illustrations that makes a Maisy book, Maisy’s Sailboat is a new board book featuring the character we know and love. 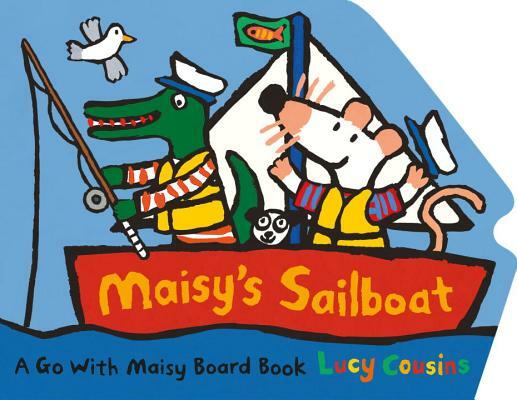 Whether driving over land or sailing across the sea, Maisy takes her friends all over the place in two shaped board books. Today is the perfect day to go sailing in Maisy’s boat! When Maisy and Charley stop at the blue lagoon for fishing and snorkeling, how many colorful fish will Maisy see under the water? What surprise will Charley catch on his fishing line? What an adventure out on the waves! Three cheers for Captain Maisy! Another solid, engaging piece from Maisy and Co.